Inky Fairy Designs: Saturated Canary New Digi's! As soon as I saw her, I was in love...yet again! I love the way Krista draws hair so beautiful and flowing. I created a bookmark with her. I've been reading a ton and wanted something sweet to save my pages. The thing is I tend to read multiple books at a time, so I need to create a couple more! haha These are my favorite bookmarks to make and I created a tutorial that you can find HERE. WOW that is totally amazing!!!! Ohhhh are you SERIOUS?! I'm thrilled for you girl. I'm not surprised you were asked - your work is freakin' awesome!! What a fab way to kick this off! I love this cutie - those boots are awesome! Gorgeous red hair and the pinks you've used are fab. I really appriciate the supplies list you have at the end - they help me a lot Copics wise!! You are too talented for your own britches girl!!! WOW!!! These colors are AWESOME and the image is just lovely. Stunning project!!! Wow ! Love this image and your creation is really wonderful ! Hi Teamie!! This is gorgeous I LOVE her hair! Love the bookmark!! What a fabulous image and the hair color is to die for. Great folds on the dress. Gorgeous my friend. Hey, I've been here before... sheesh woman.. you make these images look FANTASTIC! I wish I had an ounce of your talent! Love ya! Thanks so much for playing along with The Altered Alice! I love the image and the way you colored her. What a great bookmark, thanks for the tutorial! 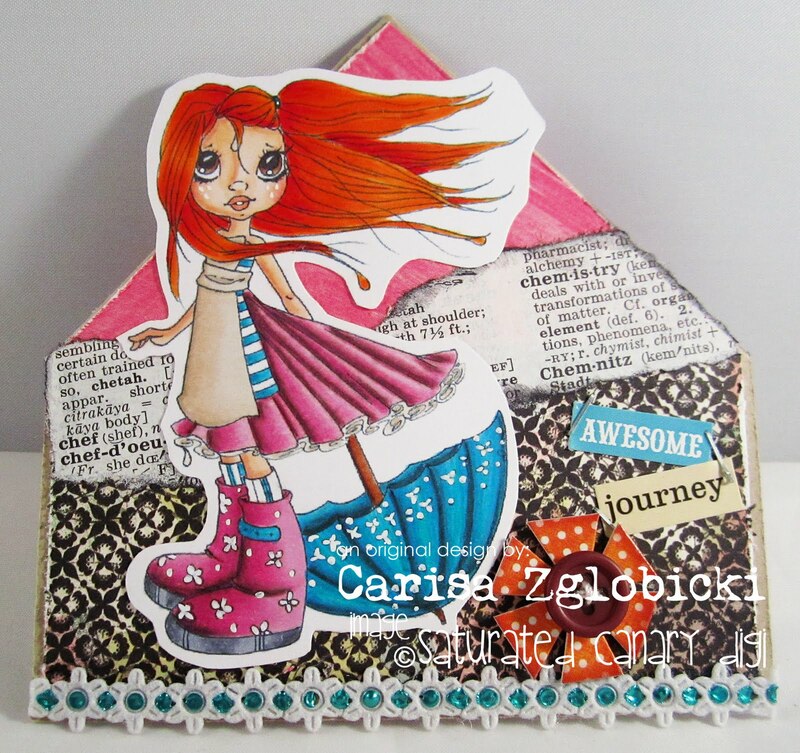 Adorable bookmark!I can see why you are in love with that girl,she's so cute and she has really gorgeous boots and umbrella:)Love the papers and the colours!Well done! Thanks for joining us at ATSC,hope to see you again! A gorgeous bookmark! lovely bright colours and a great image! Thanks for joining us at ATSC. Gorgeous bookmark Carisa, I love the image I bought her the other day despite saying I wouldn't buy anymore until I used the stamps I already had lol.